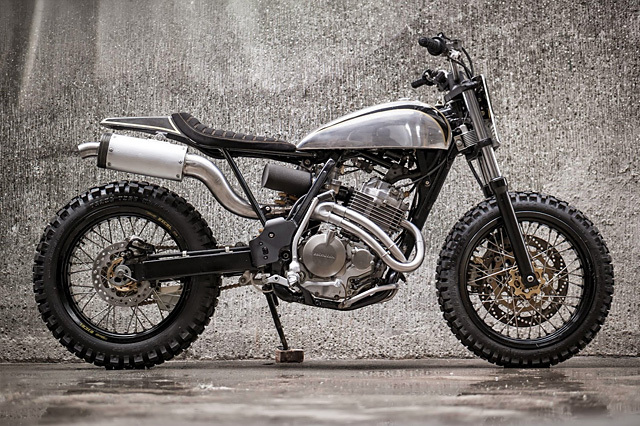 I’m sure all Pipeburn readers were caught up in the outpouring of emotion that swept the community when Honda discontinued the XR400R. I personally remember lighting a candle and settling into bed early, listening to the radio address from the Pope lamenting the passing of one the tidiest mid-range enduro bikes to be manufactured. No? You didn’t hear about it? Well, you wouldn’t be the only ones who missed the mid-range trailbike’s departure. With its relatively light weight and moderately powerful air cooled single-cylinder engine the Honda XR400 is probably the kind of bike that would suit most people’s riding, but is usually overlooked – but not by the guys at Benjie’s Café Racer, who have spent no small amount of time turning this 2005 model into a beautiful, but practical on and off-road commuter. For those of you who don’t know much about the XR400, I can’t blame you. 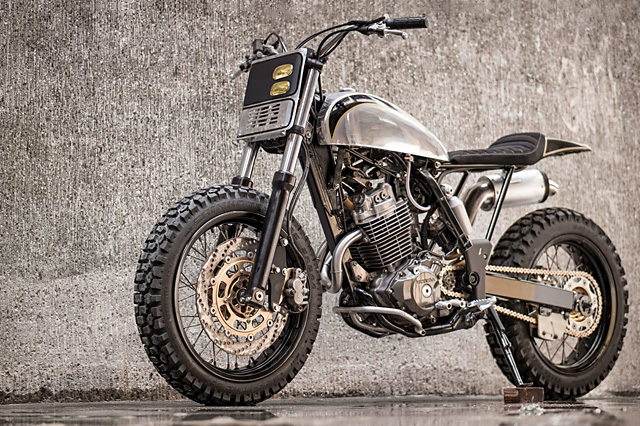 Built from 1996 to 2004 it occupied a strange place in Honda’s product line up – between the diminutive entry level XR250 and strong-as-the-balls-of-Thor XR650R. The 400 is often overlooked by many riders, being too large for beginners to fall off, too slow for the Monster Energy drink crowd and too small for Ewan McGregor-esque cross continental expeditions of narcissism. But it’s still a dependable, easy to service bike with a good amount of usable horsepower. And there’s a few more ponies in this particular example – when they first got their hands on the XR it had already undergone the ‘Super Commuter’ treatment, with 17” Talon wheels, Akrapovic exhaust, 450cc piston kit and hi-lift cams. 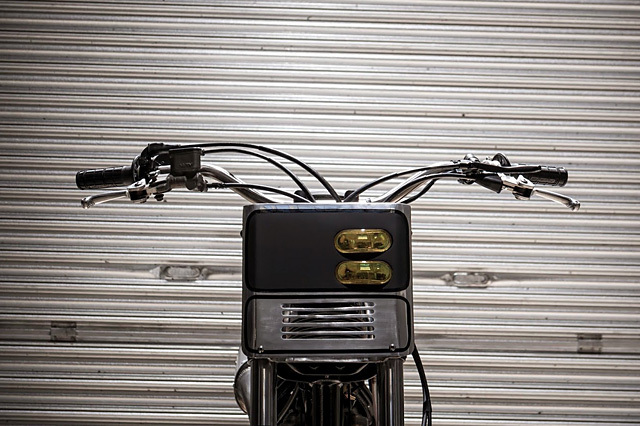 The guys from Benjie’s Café Racers removed all the faded old plastics and spent no small amount of time planning the best way to turn this practical bike into a neat custom bike. One of the first things they tackled was the front end of the bike – and there’s a surprising amount of work that goes into getting an enduro bike set up with a stance like this. The standard long-travel XR forks were swapped for a pair from an early model Honda CBR600 which, while lowering the front end and bringing the wheel closer to the frame, yielded its own set of challenges – the steering stem had to be modified, a new front axle fitted and a new brake caliper mount had to be milled. The lower front end raised the Honda’s tail like a flirty moggie so a new, flatter rear subframe was manufactured to bolt into the existing mounting points. 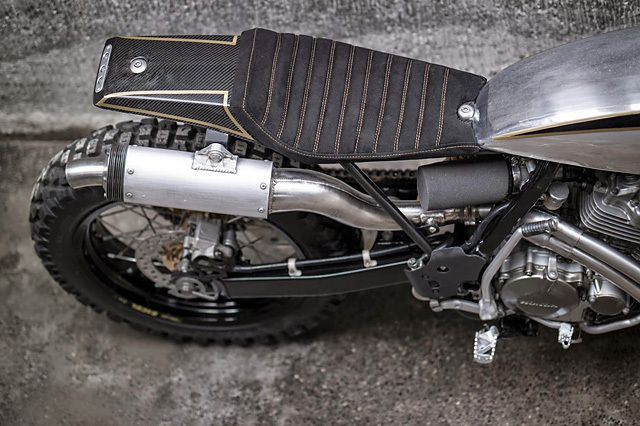 A flat tracker seat was fabricated out of carbon fibre, with LED brake and indicator lights mounted on a small brushed aluminium plate. The upholstery was finished in durable Alcantara suede, double-stitched in gold to match the tank. 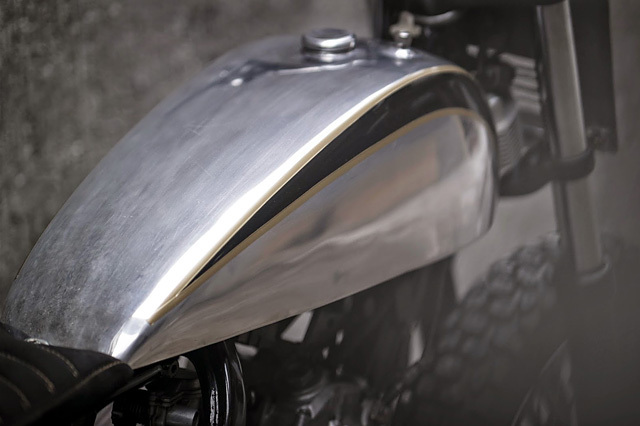 And Benjie’s Café Racer didn’t go the easy route with the tank either – deciding to make their own teardrop-shaped polished aluminium number from scratch. 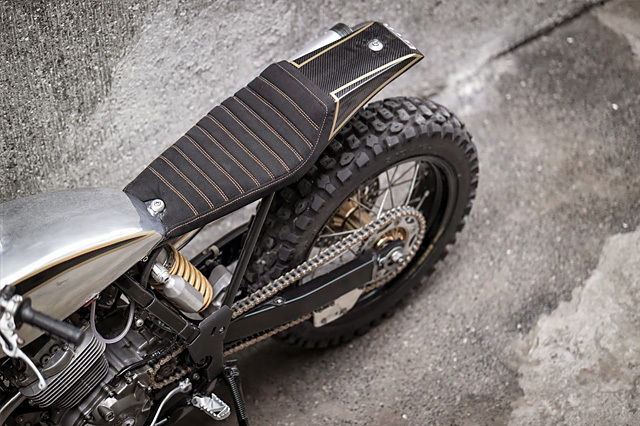 Finished with an understated black and gold scallop and a tidy little gas cap they also made themselves it looks beautifully proportioned and light – and as someone whose attempts to build an alloy gas tank resembled something like an after grog bog from Wall-E I’m especially impressed. 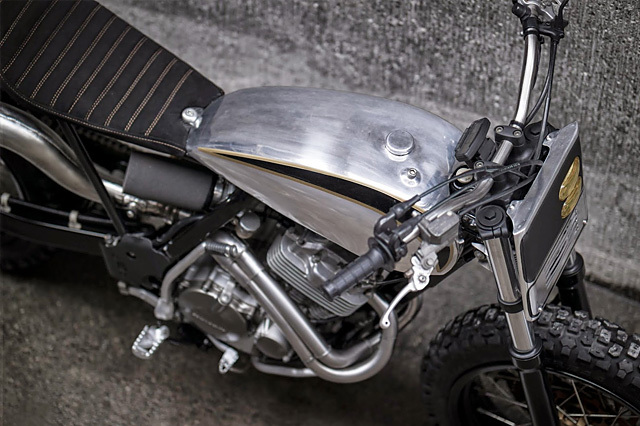 Their fabrication skills didn’t stop there – the bars were bent out of 7/8 stainless steel and the front number plate was also made in-house out of aluminium, strategically cut to allow air flow to the oil cooler. The oversized header pipe is also their creation – left with a brushed finish with exposed welds. 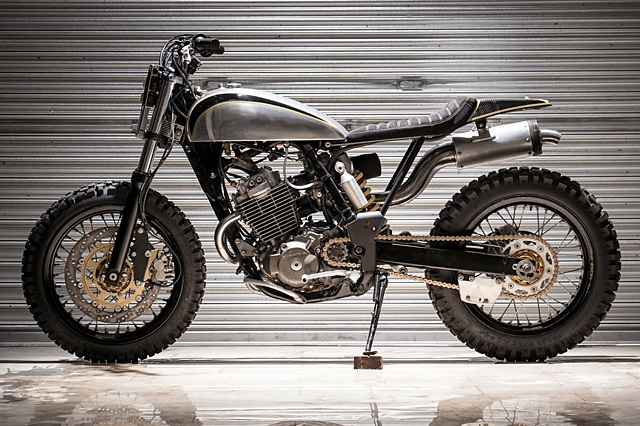 The guys from Benjie’s Café Racers have taken a humble XR400R enduro and made an ordinary bike really special. They’ve shed a lot of weight, replacing parts with aluminium and carbon fibre bits of their own fabrication and managed to keep the lines flowing beautifully. And the finish is fantastic too, with just the right mix of polish of measured restraint. 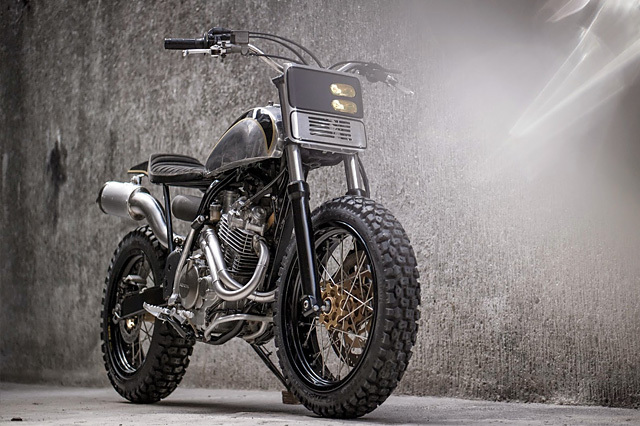 This XR looks to be a bike that would not only looks gorgeous but would be terrific fun to ride – which can be a rare mix on the custom bike scene.